The Gardeners Club is a free to join online club for everyone with an interest in gardening and gardens. Gardeners Club Societies is a new section of our website dedicated to supporting gardening and horticultural societies across the United Kingdom. Since the Gardeners Club started in 2000, we have supported local clubs and societies by providing over 100 of them with a complementary website page, now following the update of The Gardeners Club website, we are delighted to be able to continue with this support. Each local gardening club or society will qualify for a free one page website within the Societies section, the offer also includes free hosting. • Up to 10 information points, e.g. Contact name, Telephone number etc. Additional pages, dedicated URLs, image galleries etc. can be added at a discounted cost. 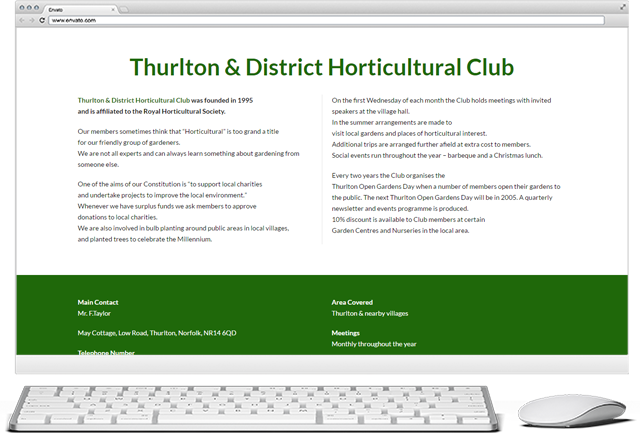 Gardeners Club provides free one-page websites to it’s member’s local gardening societies! Got a change to your Gardeners Club Society website? Get in touch here and a member of our team will be in touch to assist you!